Create a new theme by inheriting from the Barceloneta theme. Use the manifest.cfg to register a production CSS file. Use an XInclude to incorporate rules from the Barceloneta theme. Use ?diazo.off=1 to view unthemed versions. Use conditional rules to have a different backend theme from the anonymous visitors theme. Diazo rule directives and attributes. Viewing the unthemed version of a Plone item. The theme provides styles and assets used by Plone’s backend tools. Inheritance involves including the Barceloneta rules.xml (++theme++barceloneta/rules.xml) and styles. The prefix/unique path to the Barceloneta theme is ++theme++barceloneta. It is necessary to include a copy of Barceloneta’s index.html in the root of your custom theme. The three key files involved are manifest.cfg, rules.xml and a Less file defined in the manifest which we will call styles.less. Use “Build CSS” to generate a CSS file from your custom Less file. Copying Barceloneta makes your theme heavier and will likely make upgrading more difficult. 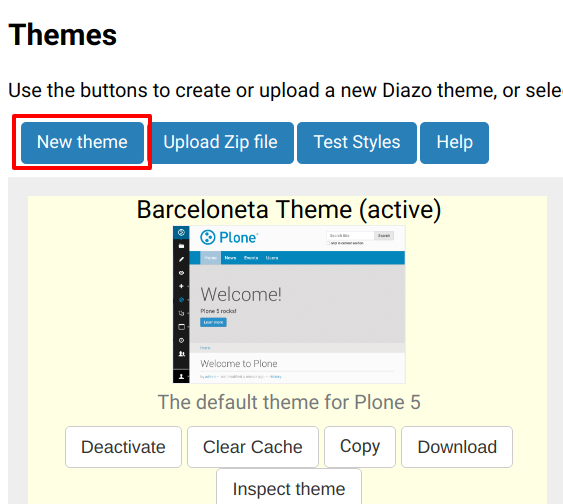 The Barceloneta theme provides many assets used by Plone’s utilities that you do not need to duplicate. New releases of the theme may introduce optimizations or bug fixes. By referencing the Barceloneta rules and styles, instead of copying them, you automatically benefit from any updates to the Barceloneta theme while also keeping your custom theme relatively small. In this exercise we will create a new theme that inherits the Barceloneta rules and styles. Go to the Theming control panel. Click on Create and you get redirected to your new theme’s inspector. In the theming editor, ensure that your new theme contains the files manifest.cfg, rules.xml, index.html (from Barceloneta) and styles.less. Create a copy of the file index.html from Barceloneta (this one cannot be imported or inherited, it must be local to your theme). Generate the styles.css CSS file using styles.less. Click the buttons Save and Build CSS to create the file. When you create your Diazo rules, it is important to know how the content Diazo is receiving from Plone is structured. In order to see a “non-diazoed” version page, just add ?diazo.off=1 at the end of its URL. What do you think is the difference between “content-core” and “content”? There are several viewlets, how many do you count? Can you identify any portlets, what do you think they are for? The “content-core” does not include the “title” and “description” while the “content” combines the “title”, “description” and “content-core”. Out of the box there are six viewlets (viewlet-above-content, viewlet-above-content-title, viewlet-below-content-title, viewlet-above-content-body, viewlet-below-content-body, viewlet-below-content). There are a few footer portlets which construct the footer of the site. The Diazo rules file is an XML document containing rules to specify where the content elements (title, footer, main text, etc.) 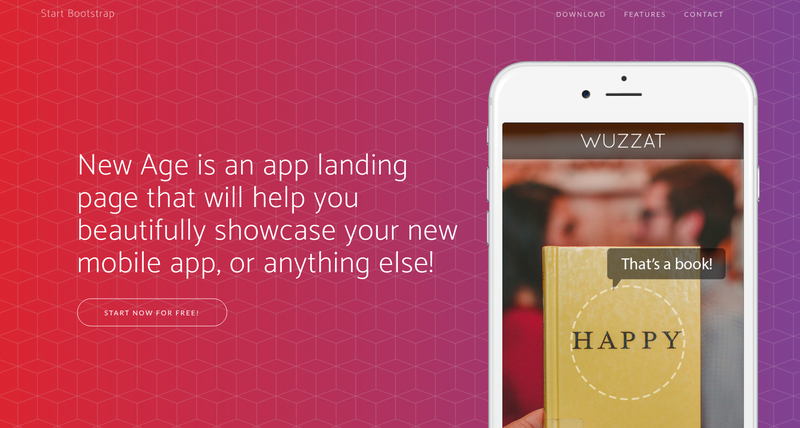 will be located in the targeted theme page. The rules are created using rule directives which have attributes; attribute values are either CSS expressions or XPath expressions. Used to select target elements from the theme using CSS3 selectors. Used to specify the element that should be taken from the content. Used to select the children of matching elements. Used to identify the children of an element that will be used. Depending on complexity of the required selector it is sometimes necessary or more convenient to use XPath selectors instead of CSS selectors. XPath selectors use the unprefixed attributes theme and content. Used to select target elements from the theme using XPath selectors. Used to specify the element that should be taken from the content using XPath selectors. Used to select the children of matching elements using XPath selectors. Used to identify the children of an element that will be used using XPath selectors. You can also create conditions about the current path using if-path. The following attributes can be used to conditionally activate a directive. Defines a CSS3 expression: if there is an element in the content that matches the expression then activate the directive. Defines a CSS3 expression: if there is an element in the theme that matches the expression then activate the directive. Defines an XPath expression: if there is an element in the content that matches the expression then activate the directive. Defines an XPath expression: if there is an element in the theme that matches the expression then activate the directive. Conditionally activate the current directive based on the current path. the current subsite (if any). In the Plone “universe” it is not uncommon to convert an existing HTML template into a Diazo theme. Ensure that when you zip up the source theme that there is a single folder in the root of the zip file. We will explore this in more detail in the next exercise. In this exercise we will walk through the process of converting an existing free HTML theme into a Diazo-based Plone theme. We’ve selected the free New Age Bootstrap theme. The theme is already packaged in a manner that will work with the theming tool. When being distributed, Plone themes are packaged as zip files. A theme should be structured such that there is only one top-level directory in the root of the zip file. By convention the directory should contain your index.html. The supporting files (CSS, JavasSript and other files) may be in subdirectories. To get started download a copy of the New Age theme as a zip file. Then upload it to the theme control panel. This is a generic theme, it does not provide the Plone/Diazo specific rules.xml or manifest.cfg files. When you upload the zip file, the theming tool generates a rules.xml file. In the next steps you will add additional files including a manifest.cfg file (perhaps in the future the manifest.cfg file will also be generated for you). Select the downloaded zip file. Add a styles.less file and import the Barceloneta styles (look back to Exercise 1). Add rules to include the Barceloneta backend utilities. Add rules to include content, add site structure, drop unneeded elements, customize the menu. it can be tricky to dynamically replace background images provided by inline styles. Sometimes it is more convenient for your website administrators to use Barceloneta, Plone’s default theme. Other visitors would see a completely different layout provided by your custom theme. To achieve this you will need to associate your visitor theme rules with an expression like css:if-content="body.userrole-anonymous". For rules that will affect logged-in users you can use the expression css:if-content="body:not(.userrole-anonymous)". 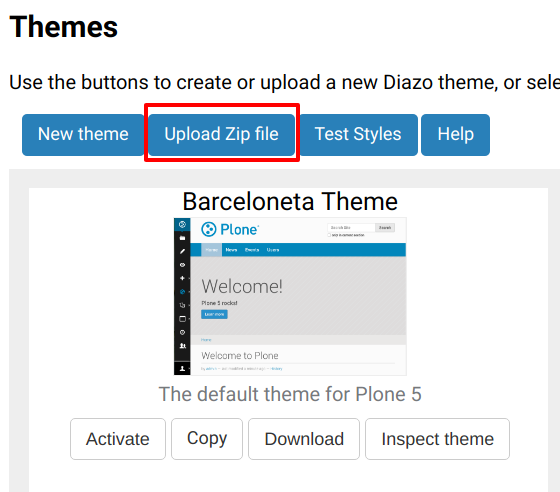 Once you’ve combined the expressions above with the right Diazo rules you will be able to present an anonymous visitor with a specific HTML theme while presenting the Barceloneta theme to logged-in users. The Barceloneta ++theme++barceloneta/rules.xml expects the Barceloneta index.html to reside locally in your current theme. To avoid conflict and to accommodate the inherited Barceloneta, ensure that your theme file has a different name such as front.html. In this exercise we will alter our theme from the previous exercise to make it into a visitor-only theme. Update the rules.xml file to include Barceloneta rules. Add conditional rules to rules.xml so that the new theme is only shown to anonymous users. Rename the theme’s index.html to front.html and add a copy of the Barceloneta index.html. Copy the contents of the Barceloneta index.html file, then add it to the theme as the new index.html file.